After the fall of Sirhind in 1763, a considerable portion of present-day Rupnagar District also came under Singhpuria Misl. The founder of the Misl was Nawab Kapur Singh, of Virk Jat of village Faizullapur, district Amritsar. When the Sikh Panth was organised into twelve misls on 29 March 1748, Nawab Kapur Singh was appointed the Commander of Singhpuria Misl. When Harmandir Sahib, the Sikh temple at Amritsar was rebuilt, after it had been destroyed by Abdali, its foundation was laid by Nawab Kapur Singh, on 17 November1763. Nawab Kapur Singh was a great warrior, he fought many battles. 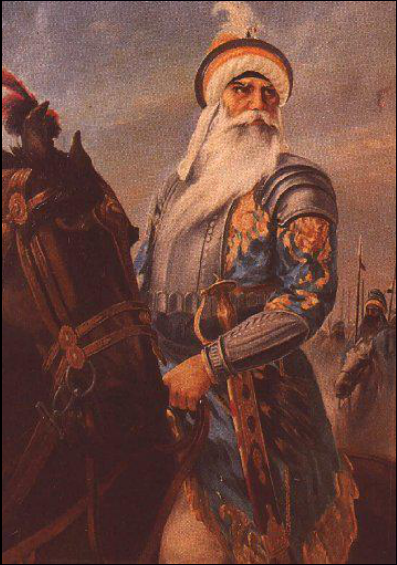 The last battle that he fought was the battle of Sirhind. As the other misls occupied their respective areas of the Sirhind Province the Singhpuria Misl took possession of many prominent territories in Punjab, including the following in Rupnagar district. The fort of Bharatgarh was the most important stronghold of the Singhpuria Misl. It enjoyed a very strategic position because of its location on the bank of Satluj River. Originally, seven garhies were built and ultimately the present fort was constructed in 1783. The area of the fort is about 7 acres and it has about 100 acres of forest land. As already mentioned, after Sardar Khushal Singh and Budh Singh, The Fort of Bharatgarh came to the share of Sardar Amar Singh who died issueless. Then it passed on to his younger brother, Dyal Singh who lived upto 1863. He was succeeded by Kehar Singh who lived upto 1885. He was succeeded by Randhir Singh who died in 1920. He was succeeded by his son Surat Singh who died in 1955. After him, his son Sudershan Singh had the ownership who passed away in 1996. Currently his son Sardar Deepinder Singh is occupying the Fort of Bharatgarh. Sardar Deepinder Singh, A Manorite has maintained this royal heritage in the way it truly deserves. He and his family still follow the same family traditions passed down since generations .A proud aristrocat, his company is something everyone looks forward to.